When I first started the Curtain-Along project last year, it was a dream of mine to be able to get a group of people together who had made gowns from this fabric and take a big awesome photo of us all together in our semi-matching gowns. I am so happy to say that this dream actually came true at Costume College this summer! 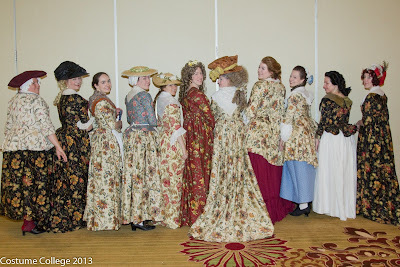 We ended up with 11 people in curtain dresses at the meetup, and I had SO much fun chatting with everybody and seeing how different each dress looked, even though they were all made from similar fabrics. After the meetup, I ran into 3 more ladies in Curtain-Along dresses who couldn't make it to our meetup time, but it was wonderful seeing them in their gorgeous dresses too. I was in Curtain-Along heaven! From left to right we have Trish from Trishstuff.com, Cait from Curse Words and Crinolines, Rebecca from Diary of a Costumer, Elizabeth (aka ashamanja-babu on LiveJournal), me, Christina Walley (who you can find on Facebook), Loren from Costumer's Closet, Alexx Iannetta (on FB and also Love3Angle on LJ), Lauren from Wearing History, Ginger from Scene in the Past, and Lauren from American Duchess. Roaming around the halls, I ran into Aimee from aimeemajor.com Isn't her little jacket adorable? Then I saw Aurora Celeste from dramaticthreads.com in a stunning gown made from the blue colorway of the Waverly Felicite fabric. It looks so different from the others that I almost didn't recognize it as the same pattern. I love how light and delicate it looks. I also totally swooned over Jackie's Victorian Curtain-Along tea gown made in an 18th c. revival style. The Watteau pleats and little train in the back were so gorgeous! Christina found a different Waverly curtain pattern to use for her gown, and I was really excited to see a new option for for Curtain-Along projects. 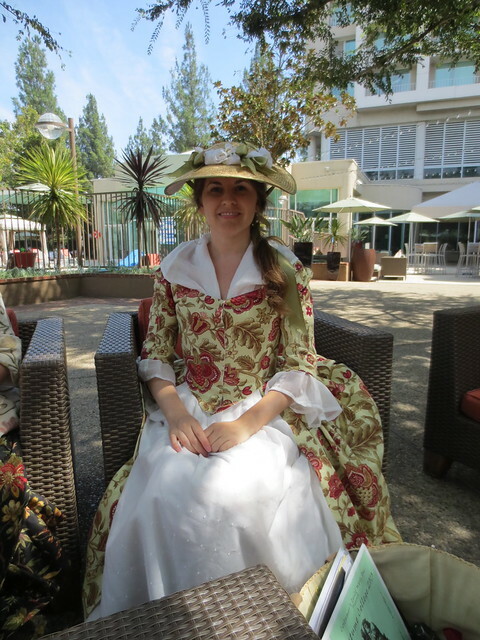 She used the Waverly Imperial Dress Brick curtains for her gown, and like several other costumers at the meetup, she combined that with the Simply Shabby Chic embroidered curtains sold at Target for the petticoat. Brilliant! Loren and Alyxx were two of our ladies in black at the meetup. I loved how Loren's gown looked combined with her black bonnet and mitts. You see so many pale colors in 18th c. dress that it's really refreshing to see a darker palate at times. Alyxx's little pierrot jacket was absolutely adorable, and I especially loved her ruffled peplum in back. That type of jacket has such a great shape. After seeing these ladies, I think I like the black colorway best of all, and it is taking a monumental effort for me to resist buying more curtains and making myself a gown in this fabric too. 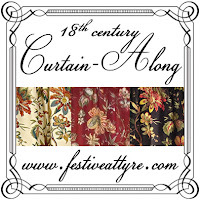 It was also great to see the Curtain-Along fabric paired with a variety of other prints and colors to see how the look changes with different fabric combinations. Cait's pale blue quilted petticoat and frothy white ruffles made it look very light and spring-ish to me, which I thought was really fabulous since I've heard several people say that this fabric is more of an autumn palette. I think Cait's combo proves that it can be perfect for any time of the year. Rebecca, on the other hand, played up the warm colors in the print with her rich burgundy colored petticoat, stomacher, and fan. So beautiful! We got such a kick out of taking photos of people in "matching" groups. Here's Cait and Rebecca in their pair of caracos. I was thrilled that another person in our group had an appreciation for the wacky mis-matched print look that I was inspired by when I made my working class Dutch outfit. Trish made her fabulously mis-matched jacket out of crewel fabric to wear with a black Curtain-Along petticoat. We make quite an eye-crossing pair, don't we? LOL! I was also tickled pink to match my friend Elizabeth with our pair of Costume Close Up swallowtail jackets and petticoats. We each made some alterations to the basic pattern to make our jackets more unique, and I think it's so fun to see the same garment reinterpreted in a variety of ways. Lauren made quite an entrance with her dress flowing behind her in the breeze! I looooooove transitional style fashions, and her 1790's gown with its higher waistline and long train is such a perfect example of this style of dress. Then we round out the 18th century with our Empire ladies in the two dresses that I think I liked best of all. OMG. Ginger and Lauren both looked incredibly gorgeous and elegant, and it was a joy to see Regency gowns with Color! and Pattern! instead of the more typical white and pastels. If either of these dresses come up missing in the future, Ginger and Lauren should probably come search my closets to find them. ;) They were both absolute perfection. I want to thank everybody who participated in the Curtain-Along meetup at Costume College this year. It was an absolute blast and more successful than I ever dreamed it would be. I'll leave you with a few more of my favorite snapshots, and you can see the rest of my meet-up pics my CoCo flickr set. I have no idea what these ladies were talking about at the time, but my mental caption for this pic has them discussing the joys of BIG hats and hair! LOL! How pretty to see all three colorways together in on shot. Sometimes it was hard to remember that it is all the same basic fabric. Everybody looks so different. And one last parting shot to show off the fabric in all its glory. Thanks for making this possible, Waverly! This week's Historical Sew Fortnightly challenge was "separates", so I decided to make up one of my antique 1910's patterns that I bought this summer. It is a very basic 7-gore skirt, and I'm guessing that it is from the very early 1910's. As is often the case with patterns from this period, it actually turned out to be more A-line than the pattern drawing leads you to believe. I made it from some wool houndstooth from my stash in green and black, and my original intention was to make a jacket to go with it later this fall. It went together really quickly over the weekend, so that was nice since I was pretty exhausted from CoCo, and I was looking for a project that didn't require much effort. But unfortunately, I'm not in love with the final skirt. There's some odd puckering along a few seams that refuses to iron out, and even though I sized it down twice, it is still too roomy over the hips, which you can't really see in this picture, but it is more obvious in life. Also, I was hoping for a skirt with straighter lines so it would have a more "modern" 1910's look. This flared shape is a bit old-fashioned for the jacket I had picked out, so there's a pretty good chance that this will be the one and only wearing of this skirt. I think I'll take it apart and try again with a different pattern when I get around to making the jacket. 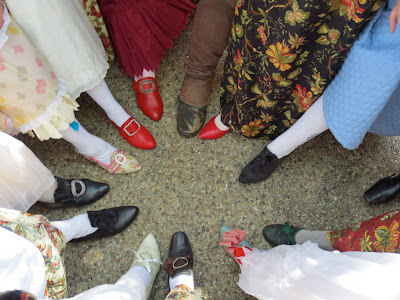 I've been meaning to do a couple of posts about Costume College, our FABULOUS Curtain-Along meetup, my new natural form ballgown, and this week's HSF project. But this is also my last week of summer vacation, so I'm having a hard time chaining myself down to the computer when there are other things that I'd rather be doing. Ahhh! Summer was over way too soon! So forgive me for the lazy recap, but I'll just say that this year's Costume College was beyond fabulous! I went to some wonderful classes, hung out with a ton of amazing people, and had a ball dressing up every day. I'll let my photos tell the rest of the story, so feel free to check them out on flickr. And if any of you were there and would like to grab pics for FB or your own blog or whatever, please help yourself. I don't need credit or a link or anything like that - I'm just happy to see them getting used.